Like most Jewish holidays, Rosh Hashanah brings to mind certain traditional food customs – the most well-known being the dipping of apples in honey. And while a classic apple pie or cake is a lovely way to commemorate our hopes for a “sweet new year”, I thought it would be fun to change things up a bit. 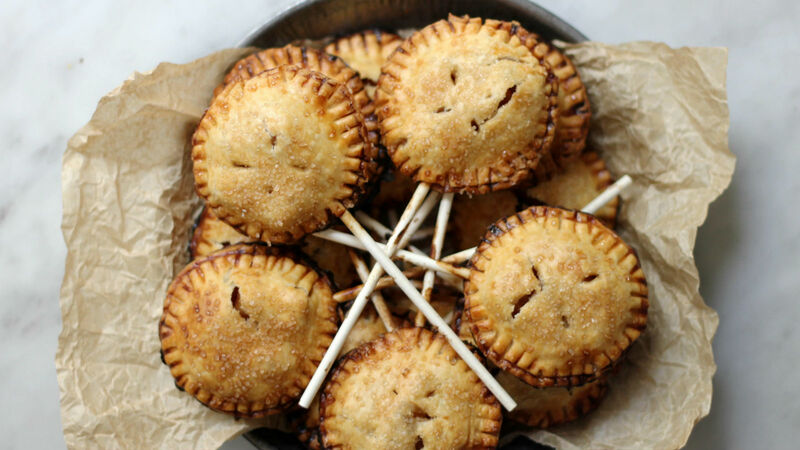 These apple and honey pie “pops” are a cinch to make – and even more fun to eat! They can be assembled (and frozen) in advance, and are especially nice to serve for a crowd – no cutting or forks needed! Even better, you only need a few simple ingredients, yet wind up with something truly delicious – and a little different. Sweet indeed! Pre-heat oven to 400; line two baking sheets with parchment paper. 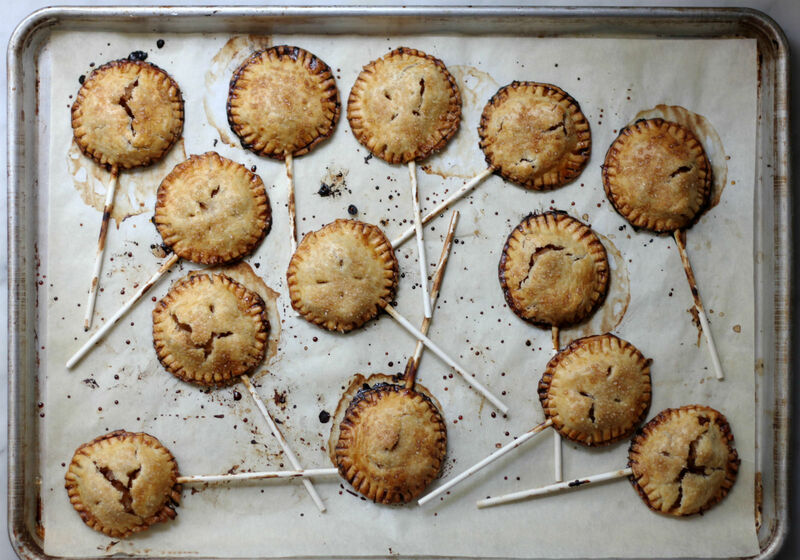 Unroll one pie crust on a work surface. Use your cutter to make as many circles as you can; place on your prepared baking sheets. Put a lollipop stick in the center of each circle, pressing down lightly to secure. 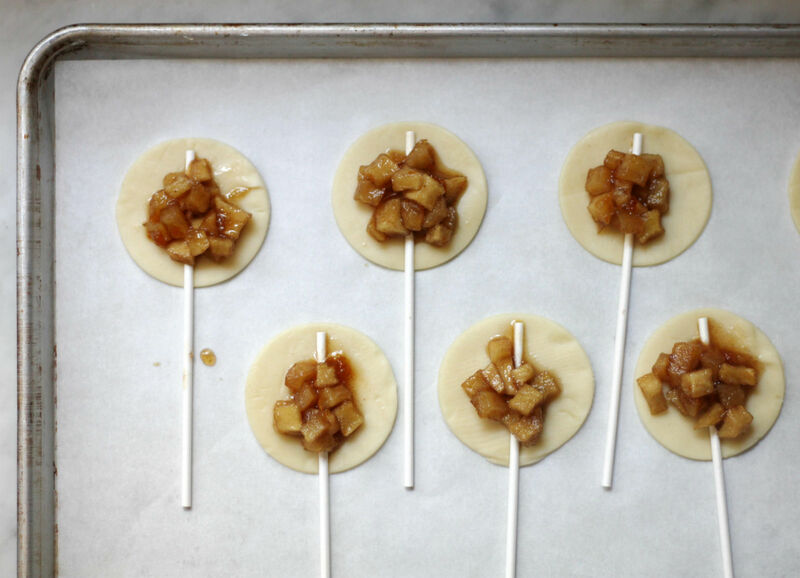 Place a teaspoon of cooled filling on each circle. Use a pastry brush to brush a bit of the beaten egg around the edge of each circle. Unroll the second pie crust and cut out an equal number of circles to the first crust – place atop the filled crusts and press lightly to seal. Crimp the edges with a fork, and make a few small incisions in the center to allow steam to escape. Brush tops with the egg and sprinkle with the raw sugar (pops may be frozen at this point – reheat directly from the freezer, adjusting baking time by a few extra minutes).